Mike Peppers is generous and compassionate, traits that make him well-suited for his role as the Quad-Cities’ best-known Santa Claus. Peppers, 72, of Davenport, received those traits – generosity and compassion — from his father, Tom Peppers, who died in 1964. Monsignor Edward Joseph Flanagan, an Irish-born Catholic priest, founded the orphanage known as Boys Town located in Douglas County, Neb. When Tom Peppers grew up, he became a machinist in Des Moines and was adept at grinding crankshafts, a job that took a lot of skill. Later, in Davenport, he converted a model T crankshaft grinder to a late model crankshaft grinder run by an electric motor. Then he bought one piece of equipment at a time and built a machine shop, Pep Auto Shop, where he built race cars for others. Tom Peppers and his wife Leona had six children, two girls and four boys. Things were tight financially. As he told the story, Mike Peppers paused to wipe away tears rolling down his cheeks and apologized. Though Tom Peppers’ family was needy, he was always generous and compassionate. That act of kindness nudged Mike Peppers toward his role as Santa, and he is now in his 45th year. When his brother Bob was president of the Davenport Jaycees, Bob asked him in 1965 to help the Jaycees to deliver toys. Mike Peppers’ journey toward becoming the Quad-Cities best-known Santa Claus took a turn as he served in Vietnam in the Army. When his two-year hitch in the Army ended, Peppers, then a sergeant, came back to the states and took up where he’d left off — delivering packages to needy children with the Jaycees. “Back then you couldn’t buy a Santa hat,” said Peppers. So his wife Kathie bought some material and made him one. He went to a T-shirt shop and ordered a red T-shirt that said “Santa’s helper” on it. And he bought himself a red coat. Kathie eventually found a pattern and in 1969 made Peppers an entire Santa suit. “So that’s how it all began,” he said. Peppers encountered some sad environments. Some children were clothed only in their underwear and lived in filthy, roach-infested apartments that smelled of urine. The Jaycees used to tell him how lucky he was that, as Santa, he got to go inside while they waited outside in the cold. So Peppers invited them to join him. “After about one or two minutes inside the house, they were back outside,” he said. Often there were no Christmas trees in the poor children’s residences. So the Jaycees went to Christmas tree lots and looked for trees that no one wanted, then delivered them to the houses of the needy children. Today, a dozen custom-made Santa suits hang in the closet of Mike Peppers’ office at Sergeant Peppers Auto Shop in downtown Davenport. They are of various weights for various weather conditions. Though stained with perspiration, Peppers still uses a 6-foot black belt made in 1978 for him by a friend who did leather work. Peppers takes his role as Santa seriously. He looks the part every day of the year. With white hair and a roly-poly build, he wears red shirts seven days a week. With the help of his elves, he creates a colorful Santa trading card each year that he happily hands out to those he encounters. He doesn’t use the computer himself, but he has a website, santaqca.com. The office that Peppers and his assistant share is a shrine to Christmas and Santa Claus. Hundreds of ornaments of Santa Clauses of all shapes and sizes line numerous shelves. They are made of glass, ceramics, wood, cardboard and steel. Peppers didn’t set out to start a collection of Santa memorabilia. But he bought some Santa Clauses for himself, then other people started giving them to him. Some of the Santas and ornaments are from foreign countries like Italy, Norway and France. He has a snow globe from Germany. There is a wooden Santa Claus from Ukraine. It really is a series of hollow Santas, one inside of another. Some Santas have special meaning now because of who gave them to him. Peppers, the official Santa of Quad City Arts’ Festival of Trees, has several items given to him by the late Festival of Trees chairman, Karen Getz. “Karen was a mentor and pushed me to keep me going,” he said. He also has a Santa from the late Deb McDaniel, festival staff director from 2005 to 2013. One of Peppers’ prized possessions is a Scott County sheriff’s badge, proclaiming Santa a special deputy. 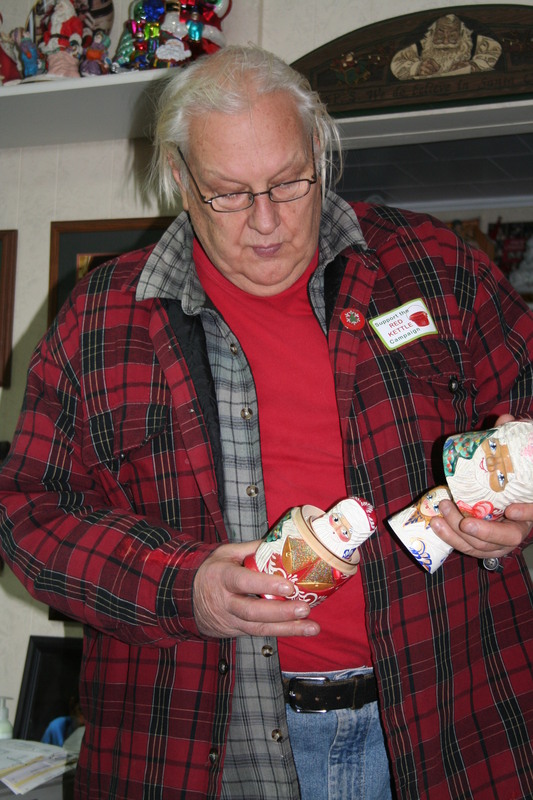 “Mike has put a local face on Santa in the Quad-Cities,” Sheriff Dennis Conard told The NSP. “The Santamobile with a smiling Santa at numerous parades and local events has become an institution of the Christmas season. Peppers is also quite proud of having won the Hometown Heroes Award, one of many honors bestowed upon him over the years. There are photographs in Peppers’ office of him as Santa plus a Ward Olson painting of him flying through the air in his Santamobile, a large, red, sleigh-like convertible that’s been commemorated as an Isabel Bloom figurine. On Peppers’ desk, next to a basket of complimentary candy canes, is the 2014 schedule of appearances Santa must make. Typewritten, it fills nearly two legal-size sheets of paper beginning with an Oct. 4 appearance. It’s a rigorous schedule, and some years – like one in which he was fighting cancer — have been more difficult than others. 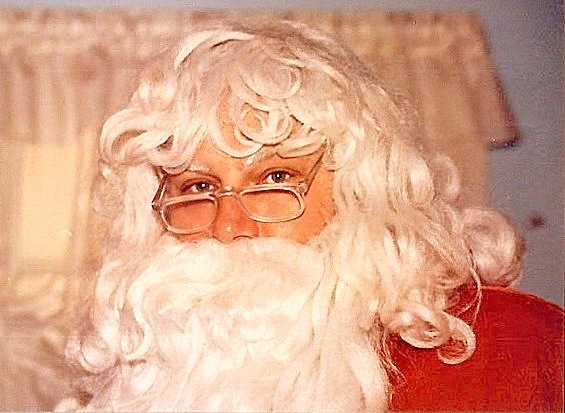 Does he ever get tired of being Santa? Peppers and his wife Kathie don’t have any children, although he has a grown daughter from a previous marriage and a grandson. But depending upon how you look at it, Mike Peppers really has lots of children. “We handle about 8,000 children per year,” he said. Copyright 2014 by Phil Roberts, Creative Enterprises. This ran as a feature in The North Scott Press, Eldridge, Iowa.